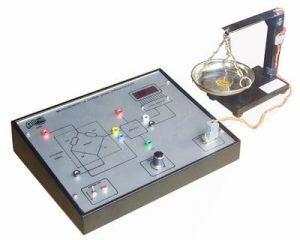 ADTRON’S Strain measurement system demonstrates the principle and working of the specialized dedicated transducer known as “Strain Gauge” and also shown is one of its unique applications to measure strain in Kg. The trainer also consists of tare adjustment facility and digital readout, all enclosed in a specially designed user’s friendly elegant powder coated metal cabinet with intelligently designed circuit layout on imported acrylic front panel are some of its important features. Parameter Measured : Strain in terms of Kilograms on a cantilever beam. b] Transducer with electronic instrumentation. Transducer : Temperature compensated strain gauge. Type : Cu-Ni foil with polyamide carrier base. Gauge Resistance : 350 Ohms (Nominal). Gauge Width : 2.4 mm. Gauge Base : 12.5 mm x 4.3 mm. Transducer : Strain gauges mounted on a stainless steel Measurement cantilever beam. Configuration : Bridge with two arms as strain gauges (Wheatstones Bridge principle). Range : 0 – 5 Kilograms. Actual Strain : By various weights to be placed in a pan fixed with the beam. Tare Adjustment : Zero adjustment by a ten turn potentiometer. Readout : 3.5 digit digital display to indicate strain in kilograms. Test Points : Multicoloured test points are provided at various stages in the circuit to observe waveforms and voltages. Panel Size : 10″ x 13″.